For a little while I had wanted to write about our village’s closest town. 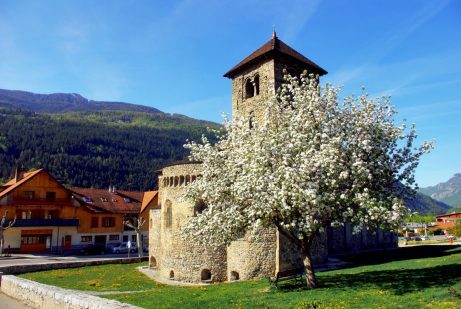 The little town of Aime lies in the Tarentaise Valley between Moûtiers and Bourg-Saint-Maurice. Since 2016 it has been part of the new commune of Aime-la-Plagne. Aime is famous for its St. Martin basilica, a jewel of early Romanesque architecture. 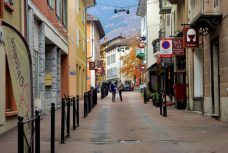 The town makes a great base to explore the region, from the Beaufortain to the Vanoise massifs. Follow the guide! 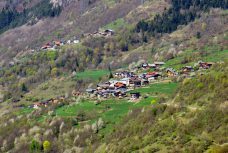 When driving from Moûtiers, you’ll reach Aime through the Etroit du Siaix where the Tarentaise valley is suddenly compressed along the sides of the mountains. This remarkable site is the narrowest passage of the whole valley. A tunnel was inaugurated in 1990 to ease the crossing of this dangerous place. Once outside the tunnel, you’ll enter the territory of the commune of Aime-la-Plagne. On the viaduct, you’ll discover the village of Centron to the left. From there the valley becomes more open and wider. Of course you won’t be spending hours visiting Aime. But it makes a great stage on your way to the mountains of Vanoise and Beaufortain. Aime means “love” in French… but the origins of the name has nothing to do with the virtue of compassion. It refers to Axima, the former capital of the Centrones tribe in the Ancient Times. This Celtic tribe used to control the Graian Alps and the strategic alpine routes of the Great and Little St. Bernard passes. Aximus was the name of a local divinity, protector of water sources. Ptolemy mentioned Axima on his world map around 150 AD. The site was then crossed by the Roman way of Alpis Graia which linked Vienne (South of Lyon) to Milan. 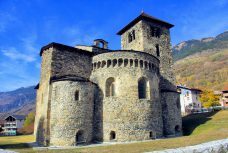 The Romanesque church is one of Aime’s oldest buildings and a jewel of Romanesque art in Savoie. The sanctuary was built in the 11th century in Lombard Romanesque style (see on the exterior of the church the ornamental bling arches called lombard bands). It features a massive bell tower. Inside the church are Byzantine-style frescoes from the 12th century. In the 19th century, excavations were led in the crypt. They revealed the remains of a Roman basilica (2nd C AD) and a primitive church (7th C). A small lapidary museum display Gallo-Roman artefacts. 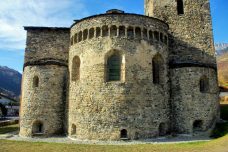 The Aime basilica was a priory church belonging to the Saint-Michel-de-la-Cluse in the Susa Valley (now Italy). Built in the 14th century, the Montmayeur Tower was part of a fortified house that commanded a toll bridge on the Isère River. The keep tower is 19 metre tall and its walls are 2.40 metre deep. It takes its name from the tower’s owners whose possessions stretched beyond the region: the Montmayeur, Viscounts of the Tarentaise. The tower can be visited. In fact there is an interesting permanent exhibition inside which describes the regional habitat. The parish church of Aime is devoted to St. Sigismond, King of the Burgundians from 516 to 524 AD. The current sanctuary was built between 1675 and 1679. Inside the church are 14 side chapels. If the exterior of the church appears quite sober, the surprise comes from the extravagant and sumptuous inside. 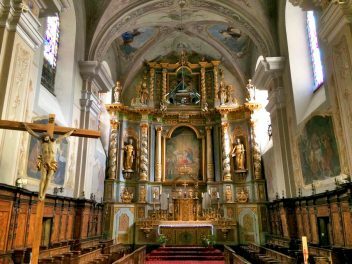 Look for the beautiful Baroque altarpiece placed in the choir of the church. Made by Jacques Clérant in 1725, it was restored in 1813. The altarpiece is characterised by a profusion of ornaments and sculptures finely designed with colours and gold. Notice the fine pulpit to the left of the nave. Designed between 1705 and 1710, it was made of walnut wood. The furniture is also of Baroque style and date back to the 18th century. 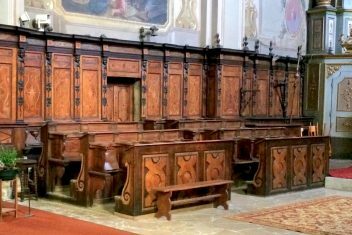 The choir stalls were sculpted in walnut wood in 1728. They can sit 40 individuals, making them the most important stalls in the Tarentaise Valley. 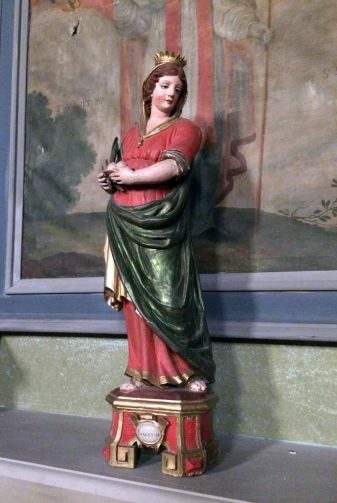 Finally, before leaving the church, look for the Nursing Madonna from the mid-14th century. 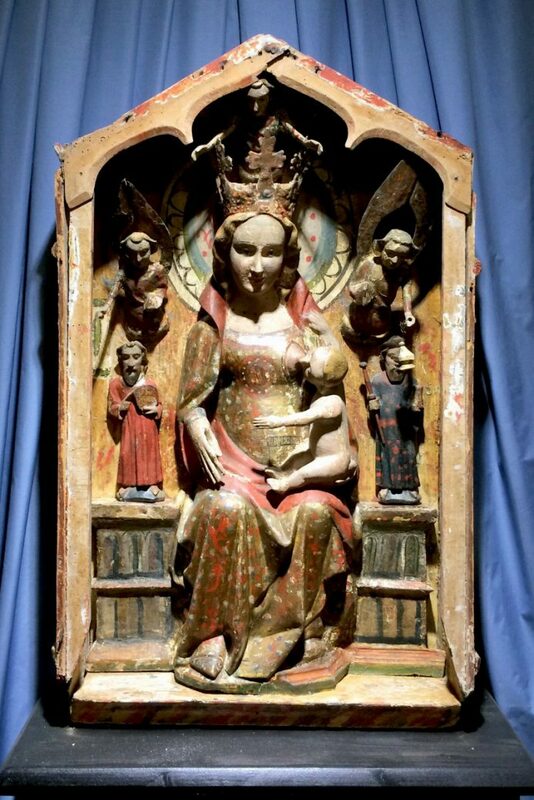 The polychrome sculpture is also known as “Vierge de Villaroland” (Villaroland Madonna) from the village which dominates Aime on the road to Granier. A nursing Madonna is a Madonna and Child representation which depicts the Virgin Mary breastfeeding the infant Jesus. Some believe that the sculpture is one of the oldest religious pieces in Savoie. The chapel is perched on the Sigismond Hill at 720 m high. It dominates the old centre of Aime. The sanctuary served as the parish church of Aime until the construction of the St. Sigismond church in the Middle Ages. It houses the Pierre Borrione museum dedicated to archaeology (Gallo-Roman and Merovingian artefacts found in Aime and its region). The main street of Aime is called Grande Rue. It crosses the old town from West to East and is bordered by shops and cafés. Notice the façades of the old houses: with their shutters and balconies, they give Aime a certain Italian feel. I mentioned above that since 2016 the new commune of Aime-la-Plagne includes Aime and surroundings villages: Villaroland, Tessens, Granier, Longefoy, Villette, Centron. The territory of Aime stretches from the Beaufortain to the Vanoise massifs, including ski resorts of La Plagne – Montalbert and La Plagne – Aime 2000. On the Versant du Soleil, the village of Granier offers a great Nordic ski domain. Aime-la-Plagne makes a great base to explore the Middle Tarentaise between Moûtiers and Bourg-Saint-Maurice. In Winter, the town is close to the ski resorts of La Plagne, Peisey-Vallandry and Les Arcs. In Summer, you’ll enjoy walking in the Beaufortain and the Vanoise massifs. In July, Aime is often crossed by the Tour de France. Aime was a start stage of the cycling race in 1995 and 2002. The Tour de France went through Aime again in 2018. 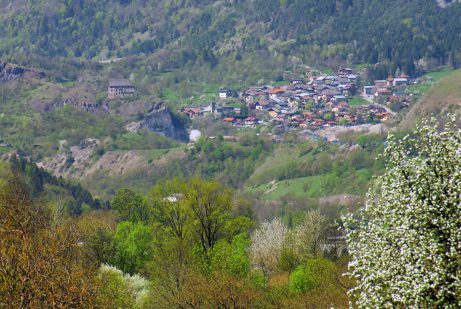 At any season of the year I love driving from Aime to Bourg-Saint-Maurice along the northern slopes of the Beaufortain. Locals call it the Versant du Soleil (sunny mountain slope) as it is bathed in sunshine all day long. You’ll cross charming altitude villages with Baroque churches: Tessens, Granier, La Côte d’Aime, Valezan, Les Chapelles and Vulmix. The scenic road offers spectacular views over the Vanoise massif and the Graian Alps on the Italian border. Aime is situated at equal distance between Moûtiers and Bourg-Saint-Maurice (15 kms). 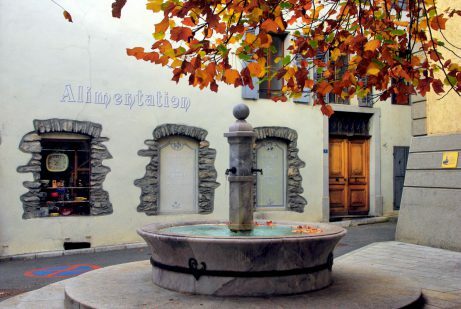 The Tourist Information Centre is located at 1139 Avenue de la Tarentaise (opposite the Town Hall and facing the old Romanesque church) – Website. For British tourists, direct Eurostar train services link London and Ashford Int. 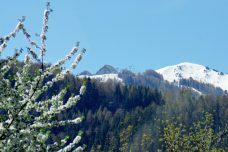 to Moûtiers, Aime and Bourg-Saint-Maurice in Winter and Spring. Other regional express trains (TER) call at the many stations along the Tarentaise all year round. The closest international airports are Lyon and Geneva. The small airport of Chambéry offer winter low-cost services with British and Dutch airports. 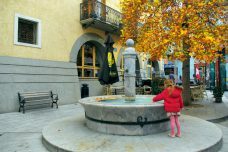 Have you been to Aime and the Tarentaise Valley? Let us know where are your favourite sites by commenting below!